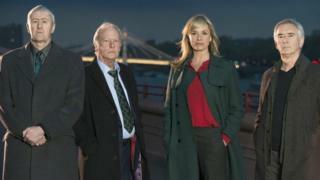 BBC One's detective series New Tricks is to end after 12 series. This summer's season will bid farewell to the cast, which features Nicholas Lyndhurst, Dennis Waterman, Tamzin Outhwaite and Denis Lawson. The channel's controller Charlotte Moore and Ben Stephenson, head of BBC Drama, said it was "important to make room for new series and continue to increase the range of drama". They also thanked the show's "brilliant creator" Roy Mitchell. New Tricks launched in 2003 as a 90-minute drama, which was then extended to a full series the following year. Ms Moore and Mr Stephen said they were " incredibly proud " of the show and thanked everyone who has worked on it. Previous cast members include Alun Armstrong, James Bolam and Amanda Redman. Larry Lamb is due to replace Dennis Waterman, who has played Gerry Standing since the first series, for the crime caper's last run. The final series will feature 10 episodes.